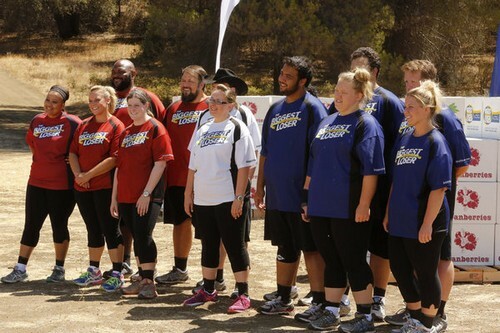 THE BIGGEST LOSER returns to NBC tonight with a new episode. On tonight’s show contestants pay it forward with a special Thanksgiving challenge, and the winning team gets a holiday dinner with loved ones. Did you watch last week’s premiere episode? We did and we have a full and detailed recap, right here for you. On last week’s show it’s was a busy week at “The Biggest Loser” ranch, which kicked off with a fun bouncing ball challenge awarded members of the winning team a welcome cash prize. All of the contestant took an emotional walk down memory lane watching their casting audition videos, reminding them why they are at the ranch — and how far they’ve come in just six weeks. Ruben and Dolvett visited music icon and 16-time Grammy Award winner David Foster at his home. On tonight’s show the contestants celebrate Thanksgiving week with a special challenge – racing to load boxes of Thanksgiving food into trucks headed to help tornado victims in Moore, Oklahoma, where one player has a special connection. Members of the winning team are very thankful for their prize – a holiday dinner shared at the ranch with loved ones flown in for the celebration. Emotional reunions follow, as the winning team, their trainer and their family members gather for a Thanksgiving feast and share what they are most grateful for. Also, one player gets encouragement from his trainer to talk to his family about a long-kept secret, and the show catches up with one of season 14’s child ambassadors, Sunny, to see how she is doing today. Then it’s time for weigh-in and another elimination, which leaves one trainer giving a very tearful and emotional farewell to one of their players. The Biggest Loser season 15 season premiere airs at 8PM on NBC and we will be live blogging it with all the up-to-the-minute details. So make sure to come back to this spot and spend the evening with us! Make sure to refresh often to get the most current details and updates! RECAP: Tanya asks how Matt is feeling after getting saved, Matt says that it’s a kick in his pride Tanya is trying to encourage Matt about how he was saved. Tanya helped make Matt realize that he needs to swallow his pride, by accepting the save. Jillian is making Jay work hard in the gym, she’s impressed with what he’s doing. Jay understands that the stakes are high now, there’s no rest for the weary. The white team are giving their all, it cuts to the red team and Dolvette thinks it would be great to see his team of five as the last five standing. Holley says that Bob has become a great friend along with being a coach. Bob talks about how he enjoys working with Holley, it makes him enjoy coming to work. Bob asks Matt how he feels about the save, he’s greatful and Bob tells him to not take it for granted. The blue team are now working hard, Bob doesn’t want the blue team to eat any fattening food. Matt knows he needs to give it all he has, there’s no time for excuses. The blue team look like they’re working hard, they don’t want to lose this weeks weigh. The teams arrive at the challenge, they see the Thanksgiving foods in boxes, along with a big truck. This week they’re going to be celebrating Thanksgiving by filling the trucks with food to help the people of Oklahoma.David talks about how his wife grew up in Oklahoma, and that her home was destroyed due to the natural disaster that happened there. Who ever wins the challenge will have a family member flown into the Biggest Loser ranch to visit. Many of the contestants know that this is the biggest and most important challenge to win, they all want the prize. The teams begin filling the trucks, we now see Sunny a kid ambassador. She’s now in her senior year of high school, she’s finding ways to take time from studying to work out. Each team has 40 boxes per person on their team, the teams begin to bring the boxes to the trucks. The red team and the blue team are neck to neck, while the white team are behind. Matt says though he’s got sweat in his eyes and is out of breath, there’s nothing getting in his way that’ll make him not win this challenge. Every team is working hard to win this challenge, they each want to see a family member very bad. The blue team ends up winning the challenge, they’re so happy to win. Hap is so greatful to win the challenge as a team, to meet his son for the first time he’s thrilled. The other teams feel heart broken because they were so close to win the challenge. Hap is happy to see his family this thanksgiving, Hap gets to see his wife and his son he never met until now; he’s so thrilled to see him. Hap’s wife brought their daughters along also to visit him, Hap is extremely overjoyed. Holley is excited to see her mom, she says that all her good qualities come from her mother. Therese who’s Holey’s mom says that she looks so good now. Bobby is talking to his mother and father, they’re so proud seeing who he’s become now after losing weight. Bobby’s father begins to cry, because he loves his son so much and he misses him. Bobby mentions that it was weird to see his dad cry, he usually never shows much emotion. Matt is talking to his wife, she says that he looks amazing. Bethany who’s Matt’s wife says to him that she misses him so much now. She says that it’s emotional with the re-scheduling with the wedding, after seeing his wife Matt has more motivation to make it to the end. The blue team are eating a healthy thanksgiving with each other, their family members who are visiting and with Bob. The blue team go around saying what they’re thankful for. Bob says what he’s thankful for is his blue team, that he’s pushed them harder than they’ve ever been pushed before; he wants them to remember this experience for the rest of their life because he’ll remember this blue team for the rest of his. Bob understands that Bobby is having a hard time after seeing his dad, because he hasn’t come out yet as gay yet. Bob says that he completely gets what Bobby is going through, turns out that Bob is gay also; he realized that when he realized it there are going to be many obstacles to meet. Bob says that coming out to his family will change him, that Bobby will finally let his family know who he really is. Bobby feels good after finding out that Bob is also gay, it makes it easier for him to go and talk to his dad about it. David says that Thanksgiving is a special time for his family, because it’s close to his first wife’s birthday; he wants to be there for his daughters and take care of them. Ever since David’s first wife passed away, him and his daughters tie a love note to a balloon and send it off into the sky. Being on the ranch is David’s way of keeping his promise to her, to become healthier. Now the teams are in the weigh in room, Bob talks about how the family could of caused a distraction for his team. Every trainer has already used their trainer save, now it’s definite that someone is going home. Red team is going first, with David going up first, from 317 pounds he is now currently at 306 pounds. David has become the first contestant to lose a hundred pounds. Jennifer goes up from 220 pounds she is now 211 pounds.Tanya was 220 pounds she is now 216 pounds. Rachel is up next, from 195 pounds she is now 183 pounds. Ruben goes up on the scale, from 401 pounds he is now currently at 394 pounds. Ruben is excited because he’s now under 400 pounds. The white team are up next, Marie is first from 207 pounds she is now currently at 203 pounds. Jay is on the scale now from 226 he is now at 219 pounds. Tumi is up next, from 256 pounds she is now currently at 250 pounds. It wasn’t enough to beat the Red team. The blue team is left to weigh in with Matt is going up first, he wants to get a good number this week. from 290 pounds Matt is now at 281 pounds. Chelsea is up next, from 197 she is now 191 pounds. Hap is up now, from 340 pounds he is now at 334 pounds. Bobby is up now from 293 pounds he is now at 284 pounds. Holley is up now to represent the blue team last, from 291 pounds she is now at 288 pounds. The blue team lost tonight’s weigh in, Holley is the one who’s going home tonight. Bob is extremely sorry, Holley says it’s alright she’s lost a lot of weight so far. She;s proud of everyone with what they’re all doing. Holley says that it’s been an amazing experience for her, she says that she respects Bob a lot for what he’s done. Bob is crying, he says that Holley has made his whole season; he says that it’s been a joy to train her everyday and talk to her. Holley says thank you to everyone, she’s going to miss everything in the house. It breaks her heart to leave them all, it’s changed her perspective views on things. She believes that she can be healthy and fit while being a competitive weight lifter. Turns out Holley isn’t the only one going home tonight, turns out it’s going to be a double elimination tonight.